Few chateaus have had the roller coaster life of Chateau d’Amboise. Built on a point overlooking the Loire River, the chateau was originally built in the Middle Ages sometime in the 11th century. It was expanded over time and became a favorite of French kings in the 1400s. Though the playground of royalty, one of Chateau d’Amboise’s most famous guests was Leonardo da Vinci, who lived and worked nearby at Close Luce, which is connected to the chateau by an underground tunnel. When da Vinci died in 1519, he was buried in the adjoining chapel. Shortly after, it fell out of favor with royalty and was left to crumble in the elements until it was named a historic monument in 1840 and restored. 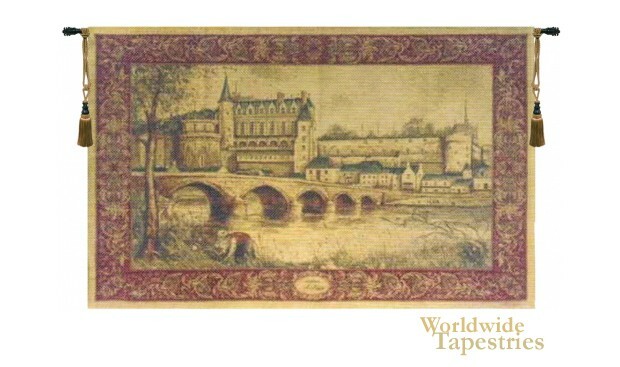 This tapestry pictures the castles from across the Loire River. Chateau d’Amboise comes unlined and has a rod sleeve for easy hanging. Note: tapestry rod and tassels, if pictured, are not included in the price. Dimensions: W 72" x H 54"